Mrs Janet MacKellar was set apart for Reader Ministry at a special service in Kirn Parish Church on Monday 18th November. 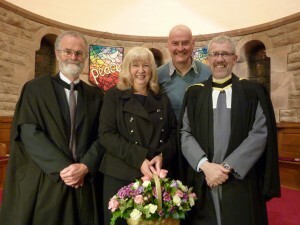 The service was led by the Moderator, Rev David Mitchell, who spoke of the warm reception Janet’s ministry had already received during her training. In his sermon, Rev Paul Beautyman, Presbytery Youth Minister, encouraged Janet to follow the example of Joshua in stepping out in faith in leadership, and to continue to give time and care to individuals who are lost (Luke 15). Janet will be placed primarily with the congregations in Central Cowal. The photo shows (left to right) Dr Chris Brett (Presbytery Clerk), Mrs Janet MacKellar, Rev Paul Beautyman and Rev David Mitchell.